Today Sonos has revealed its latest product: the Sonos Amp. As the name might imply for those into home theater tech, it isn't just another standalone speaker for the company's lineup. The new Sonos Amp is... well, an amp. It's twice as powerful as the previous Connect:Amp at 250W (125W per channel, two channels), and it has less of the Connect's cheese-grater look going on, with a slightly more modern and shorter matte black package. It'll also be a bit more expensive at $600, with availability set for February 2019. Speaker connectors "Custom" banana plugs, accepts 10-18AWG. Inputs Line-leveled analog RCA, optical digital (adapter required), HDMI (ARC supported). Outputs Auto-detecting subwoofer RCA w/adjustable crossover (50-110Hz). Connectivity 802.11b/g/n Wi-Fi (no 5GHz), dual ethernet ports. Controls on the unit itself remain simple, with three flush capacitive buttons for volume, track forward/back, and play/pause. And if the understated design doesn't do it for you or you'd rather save some space, the Sonos Amp can be wall or rack mounted as well. It works with over 100 services, can be controlled via Alexa, and the Amp also supports Apple's AirPlay 2 (if you're part of that ecosystem). Like all Sonos products, it will get new features over time with subsequent updates. Among such upcoming features are Line-in switching via third-party interfaces, volume pass-through, third-party interaction with Sonos playlists, and notification support for third-party devices (doorbells, etc.). "Professional installers" in the US and Canada can get their hands on the Sonos Amp early starting this December, but the rest of us lowly consumers will have to wait until February 2019, apparently. Santa Barbara, Calif. – August 29, 2018 – Today, Sonos (Nasdaq: SONO) unveiled the all-new Sonos Amp, a powerful and versatile home audio hub that powers traditional wired speakers with sound from nearly any source, and fully integrates these speakers into Sonos’ easy-to-use wireless home sound system. Amp will be available globally February 2019. New collaboration with industry leader Sonance will focus on creation of a series of architectural speakers to complement Sonos Amp; Sonos fully opens developer platform and adds new control APIs. 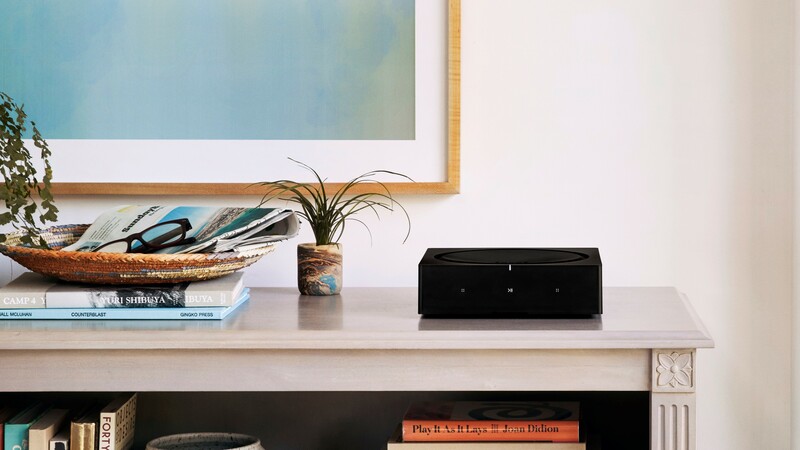 Santa Barbara, Calif. – August 29, 2018 – Today, Sonos (Nasdaq: SONO) unveiled the all-new Sonos Amp, a powerful and versatile home audio hub that powers traditional wired speakers with sound from nearly any source, and fully integrates these speakers into Sonos’ easy-to-use wireless home sound system. The all-new Amp is twice as powerful as its predecessor, supports Apple’s AirPlay 2 and more than 100 streaming services, and includes an HDMI Arc port for TVs. Launching globally in February 2019, the $599 Amp will be available to professional installers in the United States and Canada starting Dec. 1, 2018. Amp is designed to fit perfectly into standard AV racks used by custom install professionals, and can power up to four speakers with 125 watts per channel—more than enough for even the most demanding set-ups. Onboard HDMI and line-in ports means TVs, turntables, CD changers, and other audio components can easily connect with Amp and become part of the Sonos system. Amp’s thoughtfully designed and versatile hardware was built to power the Sonos software platform. New updates to the platform make it easy for installers to incorporate Amp into integrated smart home set-ups, including smart lighting and centralized control systems. It is also AirPlay 2 compatible, meaning music and other audio from any iOS device can be played wirelessly through Amp. And when wirelessly connected to an Amazon Alexa-enabled device like a Sonos One or Beam, Amp is controllable with voice commands. Finally, like other Sonos devices, Amp will gain new features, services, and integrations over time through free software updates, ensuring customers will get the best from their set-up for years to come. More Power. More Possibilities. Packing 125 Watts per channel, Amp powers even the most demanding speakers. You can now power up to four speakers instead of two. Enjoy music, TV, and more. Amp has an HDMI ARC port and an input for an additional audio source, whether listening on floor standing speakers, integrated home theater, or through a turntable. Power home theater sound. Use Amp to add stereo sound to TV, add wireless rears to a Sonos home-theater setup or two Amps for surround sound. Stream everything. Listen to music, podcasts, radio, audiobooks, and more. Also, play all the music stored on a computer or other devices. Works with AirPlay. With Amp, use AirPlay 2 to send the sound from an iPhone or iPad to any speakers in the home sound system. Choose how to control. Use the Sonos app on a phone or tablet, TV remote, keypads, AirPlay 2, or through voice with Amazon Echo and Alexa-enabled devices. More ways to customize the experience. New APIs and deeper integrations with the Sonos platform partners create seamless smart home control. Wireless. Or not. Enjoy solid and reliable WiFi performance, or connect Amp to an ethernet cable and easily turn the WiFi off in the Sonos app. Stereo or dual mono sound. Whether configuring Amp for an open floor plan or a custom listening room, create the best experience. Engineered for reliability. With a centralized heatsink, air inlets, and a discrete output stage, Amp is built to keep its cool and deliver lasting power. Amazingly pure sound. Direct digital input eliminates the need for analog conversion, so you get clear, undistorted sound for music streaming and your TV. Custom speaker connectors. A pair of threaded connections for left and right channels guarantee high-quality performance. Plus, they’re standard diameter so you can remove them and use your own banana plugs. Sonos and architectural audio leader Sonance have announced a collaboration aimed at delivering a series of three architectural speakers - in-wall, in-ceiling and outdoor - that gain additional functionality through software when paired with the new Sonos Amp. This collaboration will provide a complete offering for professionally installed architectural sound, exclusively enabling Sonos’ Trueplay tuning capabilities to ensure the best sound for the space as well as the benefits of Sonos’ software platform. These products, which will be sold and marketed by Sonos, will launch in early 2019. Sonos has been a platform company since day one, with a goal of giving customers unparalleled freedom of choice, starting with an open approach to music services and expanding to support dozens of additional content and control partners, including multiple voice services. Starting in early September, Sonos will further evolve the developer platform by fully opening up to all potential partners and will also add a new set of Control APIs, making it easier than ever to integrate Sonos into the smart home. The platform will continue to expand with new APIs that allow partners to innovate on their integrations with Sonos. New Control APIs and features make the experience better for customers, especially those with integrated control systems, such as Control4 and Crestron. Sonos will invite partners to get certified and earn the “Works with Sonos” badge. The badge will signal to Sonos owners that companies building and innovating on our platform deliver experiences that meet the Sonos high bar for quality. For those interested in building on the Sonos platform, check out the developer portal. Sonos is the leading multi-room wireless smart home sound system. As the inventor of multi-room wireless home audio, Sonos innovation helps the world listen better by giving people access to the content they love and allowing them to control it however they choose. Known for delivering an unparalleled music listening experience, thoughtful home design aesthetic, simplicity of use and an open platform, Sonos makes the breadth of sonic content available to anyone. Sonos is headquartered in Santa Barbara, California. Learn more at www.sonos.com.